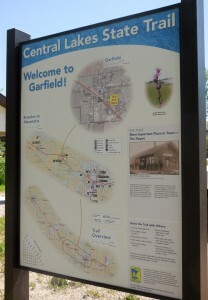 There are many recreational amenities offered in and near Garfield. The city is located in the heart of the Alexandria lakes area and provides a great place to live, work, and play. An amenity that was recently paved from Garfield to Osakis is the Central Lakes Trail, the old Burlington Northern rail bed converted to a year-round recreational trail. The trail runs from Fergus Falls to Osakis, where it connects with the Lake Wobegon Trail on the same rail bed that runs all the way to St. Cloud. This trail offers biking, hiking, and rollerblading in the summer and snowmobiling during the winter. 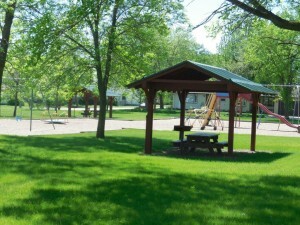 The Garfield Elementary School has a variety of playground equipment that children can play on. There are ball fields located near the school that are used for softball and other outdoor sports. Garfield is near several wonderful lakes. Lakes Chippewa, Ida, Louise, Mina, and Lobster are all within a few miles of town. To learn more about the area lakes, nearby resorts, local happenings around the Garfield area, and other great vacation opportunities, check out the Alexandria Lakes Area Chamber of Commerce web site.